DEVI heating mats are versatile heating mats developed for a variety of applications, including domestic and commercial electrical heating, as well as indoor and outdoor heating solutions. During mat installation for floor heating at newly constructed buildings, you can use them under any type of flooring: such as tiles, laminate or wood. The unique round profile (min. 3mm height) of this mat and its robust construction ensures a fast, simple and safe installation, making it perfect for renovating existing floors. Add to this our unique 20-year warranty that covers product, installation and new floor costs, so you know you are in safe hands. Place or replace. It's hassle-free. 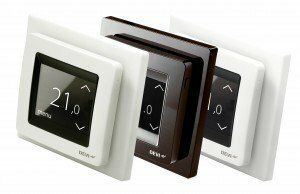 The DEVIreg™ Touch is designed to fit as many electrical appliances frame systems as possible. You can simply integrate it in the frame system you prefer or already have. The beautiful looking controller fits perfectly in any interior. Whether you use it with our design frame or your preferred frame, it is a perfect match. Electric heating control has never looked better. The DEVIreg™ Touch delivers complete peace of mind. It is the first product of its kind ever to offer a 5-year warranty. In the unlikely event that the unit does fail they will send a replacement to the address you specify. 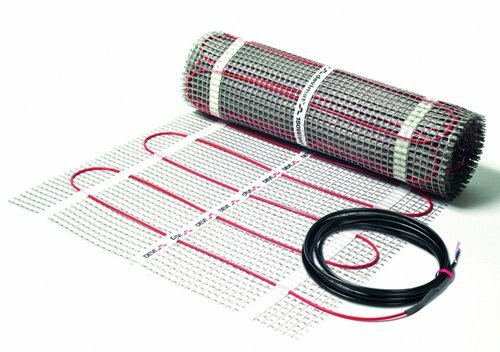 DEVIlink™ is an innovative electrical floor heating control system. 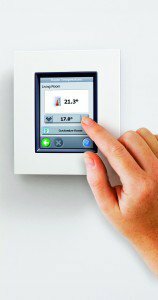 The system consists of a centrally placed main unit used to control sensors and thermostats throughout the house. This means that you can control the temperatures of your entire house from one central controller. The user friendliness is supported by the minimalistic design without a wealth of confusing buttons. The easy central heating control saves energy, as it is very simple to lower the temperature at night, and when going on holiday. DEVI electric underfloor heating is covered by a 20 year warranty, this gives you peace of mind that the products will last the test of time.